New Vandal Resistant IP villa kit. The only one compatible with building automation and security systems. YOKIS wireless automation control, Iperhome home automation management, CCTV control and burglar alarm managing are some of the included functions. MAX monitor will get these and much more. PoE IP switch 1039/44 is included in order to power the external loudspeaker unit and the monitor as well. Call forwarding to mobile devices is a built-in feature without adding any further item. One-family kit extendable to two families. 1x Ref. 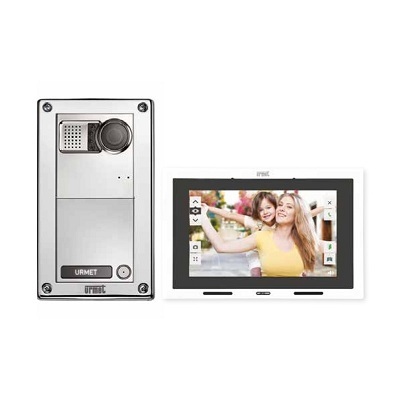 1060/31- Max 7″ touch screen built-in home monitor. 1x Ref. 1060/70 – One-button Sinthesi Steel entry panel. 1x Ref. 1039/44 – PoE Switch, with Power over Ethernet (PoE) function, 8 ports with operation either with Fast Ethernet at 100Mbps and Ethernet at 10Mbps. Ports 1 to 4 have PoE standard and automatically detect the presence of PoE-compatible devices.